Fig. 1. 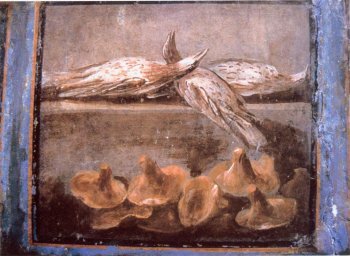 A detail of an ancient fresco in Herculaneum, depicting some Lactarius. Virtually nothing is known about the edibility of sequestrate and corticioid Russulales. On the other hand, many Lactarius and Russula are reported to be good edible species. Some of these have even a considerable regional economical value. These edible species are all obligate ectomycorrhizal mushrooms that can not be cultivated on artificial media. However, artificial mycorrhization of Pinus seedlings with several species of Lactarius sect. Deliciosi has reached a small commercial scale in the European Mediterranean area. Many species of Lactarius section Deliciosi are highly appreciated for culinary purposes. An old fresco discovered in the ruins of Herculaneum in Italy (a roman city that was destroyed together with the city of Pompei by volcano eruptions in the first century) already accurately depicts basidiocarps of the species described by Linnaeus in 1753 as Agaricus deliciosus (meaning "delicious agaric"). Lactarius deliciosus, as well as L. sanguifluus and L. vinosus are highly appreciated species in Europe, especially in mediterranean areas and Eastern European countries. Closely related species are consumed in the Himalaya, China (e.g. Yunnan province) and Japan (Lactarius akahatsu, L. hatsudake). In Mexico Lactarius indigo is a very popular edible milkcap. Fig. 2. Lactarius deliciosus and L. hatsudake (sect. Deliciosi) for sale on a Chinese market. Species related to Lactarius volemus, L. rugatus and L. hygrophoroides (members of subgenus Lactifluus ss. auct. plur.) are also often highly appreciated edible mushrooms. While mostly collected for personal consumption in Europe and North America, these species can be found in large quantities on the mushroom markets of South East Asia (South East China, Thailand). Also Lactarius cf. 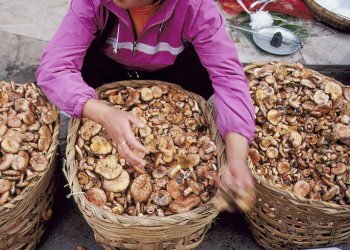 gerardii (Lactarius subgenus Plinthogali) seems a popular edible mushroom in the Yunnan province of China where wild mushrooms are important in the local diet. On the African continent, members of subgenus Lactifluus are also widely consumed and many species are often harvested in important quantities, especially in the African woodland zones (Zambezian miombo woodlands and Sudanian woodland zone), e.g. Lactarius gymnocarpoides, L. medusae, L. edulis, and L. densifolius. Lactarius kabansus and related taxa - occurring throughout the African woodlands - are another good example of very popular edible mushrooms as already observed by Livingstone in the nineteenth century. Species with an acrid taste are hardly used, but the consumption of Lactarius trivialis and L. utilis (utilis means "useful") has a long tradition in Finland and parts of Russia. In Europe, many Russula species are consumed, but these are mostly collected on a local scale and seldom traded on mushroom markets. Popular edible Russula include Russula vesca, R. cyanoxantha and R. virescens. Other common Russula, such as species in the R. xerampelina-complex, are much more popular in North America than they are in Europe. In South East China and Thailand, a look-alike of R. virescens is a highly esteemed in the kitchen and sold in markets together with other Russula, including species close to R. lepida. Fig. 3. An abundant collection of edible Russula species in a forest in Madagascar. In the African woodlands several Russula species, most of them still undescribed, are sold during the rainy season. are eaten in large quantities. Russula cellulata s.l. is one of the very common and widely occurring edible mushrooms throughout tropical Africa, but unfortunately tends to quickly develop a disagreeable smell, at least to the European taste! In Madagascar, at least one — still undescribed — Russula introduced with exotic eucalypts is commercially important during 5 to 6 months of the year, but several other, endemic Russula are collected from indigenous woodlands. Little has been written on the toxicity of Russulales, and most probably very few mild tasting species are (slightly) poisonous for human beings when boiled. However, severe poisoning cases are reported in Japan for Russula subnigricans. One Russula species described from Papua New Guinea was reported to contain psychotropic substances, but this has never been confirmed and is considered as very doubtful. From Lactarius necator a mutagenic compound (necatorine) has been isolated, and several other acrid milk caps are often listed as poisonous or suspect: e.g. Lactarius helvus, L. torminosus. Last update: 27/12/2010 - 1488786 visits (4032011 pages) since 09/01/2004.